Ryan Gauld must step up his game if he is to secure first team football at Sporting Lisbon, according to former Hearts midfielder Bruno Aguiar. 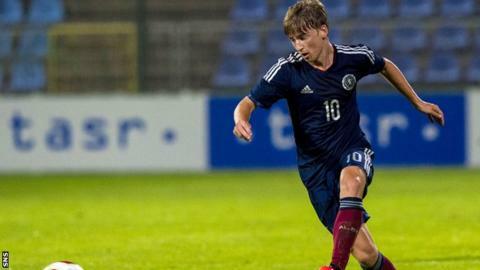 Scottish teenager Gauld scored as Sporting's second team beat Aguiar's Club Oriental side 4-3 on Sunday. But Aguiar said: "He needs to improve more and more to make it into the first team at Sporting. "At this time, he still has work to do. He needs to show more if he wants to play for Sporting A." Gauld's stunning volley in the Portuguese second division match was his second goal for the Sporting B team since he switched from Dundee United in a £3m summer move. The 18-year-old was included in Sporting's Champions League squad, but he has yet to feature for Marco Silva's first team after signing a six-year contract that includes a 60m euro release clause. And, while Aguiar, who played for Hearts between 2006-2009, has warned Gauld he was work to do, the 33-year-old reckons the early signs are promising for the youngster. "I don't know if Ryan will ever become a top player. You can't say what will happen in the future," Aguiar said. "I don't watch a lot of the Segunda Liga matches, so yesterday was the first time I've seen Ryan. "I read in the newspaper before the match about this young kid coming over from Dundee United who was supposed to be the new Messi. "And, from what I saw yesterday, you can see he has quality. "He scored a fantastic goal. He was one of their best players on the day." Sporting have now been linked with another player at Tannadice, midfielder Stuart Armstrong. And Aguiar believes that means the Portuguese giants must be happy with what they have seen from Gauld. "I was surprised when I heard Sporting had signed this young guy Gauld from Scotland because it is not normal for that to happen," he added. "Now I hear they may be looking at another player from Dundee United. "If they are doing that, it is because they think they have the quality to improve and one day play for Sporting A."